Matsuzawa speculated that this kind of visual ability is adaptive for chimpanzees, who regularly fight with other groups and need to keep track of where many attackers are at once, while ranking them by threat level. Alan Silberberg and David Kearns wondered whether the difference between humans and chimps came down to the amount of training, so they trained themselves in an attempt to reach the performance of Ayumu (Silberberg & Kearns, 2009). They played the game for 10 minutes up to ten times a day (perhaps generativist linguists do the same for training themselves to do grammaticality judgments?). After 2,500 trials, they did reach Ayumu’s performance level, but only for 5 numbers (as in the original Inoue & Matsuzawa paper). Ayumu can do 9 numbers [EDIT: The Inoue & Matsuzawa paper only goes up to 5 numerals], seemingly effortlessly. So on the plane back from the conference we built our own version of the game. You can see how difficult the task is for yourself, or train yourself to beat Ayumu! Why not pass it on to your nerdy teenage cousins? You can see the results update live here. We’ll be analysing the results as they come in, and there’s a leader board which displays the fastest players. Press Go! to start the round. Numbers will appear on the screen. After a brief pause, they will be replaced by blank buttons. Press the buttons in the correct order. The game will get harder as you go! Challenge mode: Starts with 9 numbers and decreases the latency. The game stores some information for the analysis on the server: The name you type in, a one-way encrypted version of your IP address, the type of device you’re using and your score. We can’t guarantee that this information is secure, but it should be anonymous. Someone clearly has too much time on their hands… 166 plays already. Player 15 I take my hat off to your persistence. What’s up with all the hits the blog’s been getting today? Over 1800 so far. Most to the home page at over 1300. This page is only second, at less than 200. I wish it was because of a sudden upsurge of interest in cultural evolution, but alas it’s because of an article I wrote years ago on an extinct snake called Titanoboa. Today, a film was announced about the giant snake, which has caused all the activity on this blog. On the old Replicated Typo blog there has been 18,824 hits just for today! 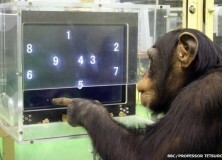 I would have never thought that a chimp has better working memory than a human. that’s crazy! Kara: Well, maybe they don’t! We’ll release some results tomorrow, but they’re looking pretty interesting so far. It would not let me play :(! But i think this is a very accurate game because it helps test humans memories and use different ways to remember the numbers order and location. For example with alot of numbers they might use grouping to remember, or they might remember the first numbers and the last numbers. Great game!! Titanoboa, isn’t that a rare language with obligatory three levels of recursion or more in each sentence, which puts a strain on working memory. I could not play the game :(! but seems like a great game to test humans memories and skills to recall information. You can tell if they recall the first few numbers and last few numbers, or if they group the numbers together, and so on. Great Game for memory! @Alicia Hmm, what happened? Could you see the ‘Arcade Mode’ button? What browser are you using, and what operating system? WAH, how mental. clearly this should be made into a facebook app, in order to maximize data harvest! That game was surprisingly challenging! I don’t think out helped (in fact, probably the opposite), but I found myself trying to use geometric information as an aid by constructing shapes and sub-shapes to remember. I wonder if anyone else did something similar and what other memory strategies people used. Interesting article; thanks for the write-up. Do you know if there are any plans to test the idea that this has to do with keeping track of attackers – maybe testing for differences between males & females, for example? I’m also curious about how Ayumu’s performance changed over time; was there anything about that in the article? In chimp mode it now shows 5 numbers, just as in the video of Ayumu. However, in the video, although 5 numbers are shown, they are picked from the range 1-9, whereas in your game they are just 1-5. Clearly the latter is easier: if you saw only four numbers, you know which the 5th one was. And if you saw only three, you still have a 50% chance of getting it right. @Marcel: You’re right, we did this on purpose to make the game easier in order to see if humans really do have a problem with processing symbols at a low latency (it also made some analyses easier!). What we found suggested that humans can identify numbers, but not remember their location. We were also more interested in comparing different kinds of stimuli (see our next post), and wanted unfamiliar stimuli to be easy to learn. It might be interesting to see the results for the original setup, although we might need a lab-based experiment to ensure that people got enough training. Hello to all. I Think this is a great game, a great challenge. I have to question if someone could answer me. The question is, if someone in ‘chimp mode’ is able to solve 1 game only 1 time for example, does that mean that one has photograpthic memory? I am just interested. Thanks you. And what if someone scores more then 1 time ? I just saw this message, sorry for the delay (and your other message on the ‘about’ page, http://www.replicatedtypo.com/about-3#comment-2053826375). Wow! That’s amazing! Sorry you’re not on the board – I may have switched data logging off (a security precaution). If you won 12 games on Chimp mode, then you are certainly the best player we’ve ever seen! The super-interesting thing is that you have a very good long-term memory. The chimp challenge game doesn’t actually require a good long-term memory (like for memorising digits of pi), but on holding visual images in short term memory. For most people, visual images fade very rapidly, so they’re pretty sure where the ‘1’ is, but quickly ‘forget’ the rest. Some people, however, can retain visual images for very long periods. 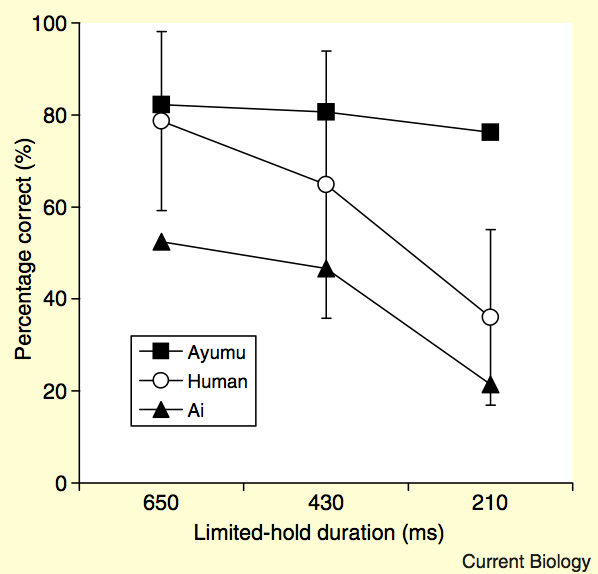 In the paper which followed this study (http://pubman.mpdl.mpg.de/pubman/item/escidoc:2021674:6/component/escidoc:2021673/chimp2.pdf), Justin Quillinan and I suggest that the difference in performance between chimps and humans is a difference in scale, not in kind. We predicted that some people would be much better at this game, either because of a disposition for better visual memory (e.g. photographic memory/ eidetic memory) or due to practice (e.g. video game players). And here you are! In the paper there are references to more work on Eidetic memory. The easiest way to go infinite on numeric chimp mode, getting 0 wrong for an indefinite amount of time, is to not try to memorize. Instead, find 1,2,3,4, 5 preferably in order in the 205ms before they disappear. Then use the sequence of locations to solve it. This method is versatile, because you just need to find 1 and then a pair and then recall the position of one of the two “unknown” numbers. For example, if you see 1 (move mouse at it), 3,4 and know 5 was back near 1 you can go just slam it out without ever seeing/parsing 2 or the exact location of 5. Times you fail to parse an adequate amount of numbers you can try to recall where numbers were positioned. No idea if it’s strange to approach it that way instead of trying to recall images. It’s the intuitive approach for me. In my first hour of play, numeric chimp only, my average score was ~6k and my highest was a bit over 14k. The biggest problem I run into right now for 7+ number with 205ms is I don’t see all of the numbers. At first I could only see around 2-3 in 9 number 205, compared to 3-4 in 5 number, now I see around 5-6 numbers, sometimes 7, but usually with no ability to recall the missing 2-3 so it’s very inconsistent. I can solve 6 number 205ms about as well as I did 5 number in that video, 7 number 205ms I fail somewhere between 1/2 and 1/4 times (with 5 lives I will solve over 9 usually, often with 2-3 game streaks). I haven’t practiced 8, and my 9 relies on 1-2 coin flips on the ones I can visually parse in time so maybe 1/30 solves at best. With increased time to see it (or two 205ms windows) I can solve the higher numbers much easier, but I haven’t really practiced slower timings. Maybe it would help me on faster timings if I did. The more I practice higher numbers the more I’m able to use conscious recall of what I saw rather than just relying on the method I use for 5 number. So it ends up being a hybrid of the two approaches. Practicing higher numbers also made me real good at 5 number, because it’s trivial to parse in comparison. If I get any better I’ll post a video of some sweet 7 number 205ms or 9 number 205ms solutions. I was kind of anxious while streaming/recording those rounds and underperformed in 6/7/9 number. I’ve put around 6 hours into the game total so far, including modifying the site on a local version to practice the modes that aren’t in the version on the site. Also, if only 5 (or 6) numbers are shown from 1-9, in any order, I can do it with the same accuracy as only showing 1-5.